Have you ever sent something to yourself via email? If the answer was yes to this question, then you are in the right place. I had the same situation a few weeks ago. The first thing that came to my mind was – I will send this to myself via email, why not? However, this wasn’t the first time when I have sent something to myself via email, and this started to bother me. The next question that arose in my mind was – there must be an application out there which would do this. Sending an email to yourself isn’t a very convenient way to do it in the 21st-century world. We all know that there is a wide variety of cloud-based storage systems on the market, like – Dropbox, OneDrive, Mega and so forth. But none of them provides an easy way how to share information across your devices in a way that would increase the usability across multiple devices. I did a search for an application that would allow to share data across my devices with ease, and I came across this application called – Pushbullet. 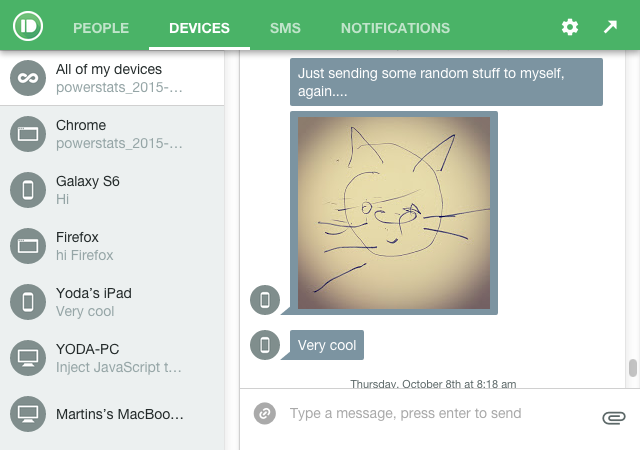 Pushbullet is something like Pastebin, Dropbox and Whatsapp mix. What it does is allows to send text messages and files to one or all of your devices that has Pushbullet installed on it. What’s even better is that this application is available on Android and iOS devices. Furthermore, it’s possible to get it on Windows and Mac OS or any of currently popular web browsers (Chrome, Firefox, Safari and Opera). UI of Google Chrome add-on can be seen below. Pushbullet also provides an open API that can be used to develop your application. Currently, Pushbullet has a growing community, and because of this there are applications for BlackBerry phones (BlackBullet, PushPlane) and Windows phones (PushPin, Pushile). Since I started using Pushbullet, I have given up on sending emails to myself and my inbox is quite thankful for that. Also, Pushbullet has other amazing features such as (end-to-end encryption, universal copy & paste, etc.). These additional features make this application a must-have if you have multiple devices, and you wish to share data over all of these devices.